Any contractor can make bold promises, but will the results fall short of expectations? Will the process be drawn out, confusing and frustrating? At Matthews Construction and Design, we strive to make the remodeling experience as simple, convenient and painless as possible for homeowners. We hold ourselves to a higher standard for both quality and service, because we believe that achieving 100% customer satisfaction is the reason behind our success. In over four decades of experience helping homeowners in Washington, D.C. and Montgomery County, Maryland, we’ve established a stellar reputation for our commitment to quality and service. 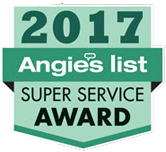 Our customers have given us an A rating on Angie’s List, as well as countless kind testimonials. Owner and president Brian Matthews brings a creative artist’s eye to the design phase of every project we undertake. Brian combines this imaginative design sense with the practical knowledge needed to bring the designs to life. With 48 years in business, Brian is able to quickly assess the situation, anticipate any potential concerns, and advise you of the most elegant and economical options for achieving the desired result. We will never leave you in the dark. You will get consistent updates on the progress of your project, directly from the owner. If problems do arise, we will notify you immediately and determine the best possible way to correct the situation. During the construction phase, we take extra care to treat your home as if it were our own. When the job is finished, we clean the site completely, and leave your newly remodeled home in perfect condition. If your project requires multiple days, we clean up the site at the end of each day, so you don’t feel like you’re living in a chaotic construction zone. We have a saying at Matthews Construction and Design: If we wouldn’t do it to our house, we won’t do it to yours. At Matthews Construction and Design, we‘re committed to quality and service, and strive for 100% customer satisfaction.